Location: 627 Santiago at Trinity St.
​ Trinity St. was envisioned as a barrio landmark, a way to replace the tagging along a major Westside street with a colorful celebration of community. The Gonzalez family offered their privacy fence to host the mural, which is a blend of painting and mosaics. Long-time San Anto muralist Jose Cosme designed the piece, using photographs of community members to fill in the letters and paper-doll figures. The mural is dedicated to the memories of Leon N. Gonzalez (member of the Gonzalez family), Trinity Sanchez (Westside elder and poet), and Ralph “Chubby” Contreras (local youth). They just said ‘Wanna paint this fence?’ And to me it was always about love, community, so that’s why you have those paper cutouts and holding hand, it’s community. And it spelled out Trinity. Simple design, yet effective. The mural shows two hands stretching out paper cutouts of the word “Trinity,” bookended by two paper dolls on each side. The letters and paper dolls contain portraits of Westside community members. The background is full of mosaics, including a green swath for the ground, blue swath for the sky, and clusters of multicolored mosaics on the right and left. Cool colors like blues, greens, and purples compose the mural, with earth tones on the sides and bottom. 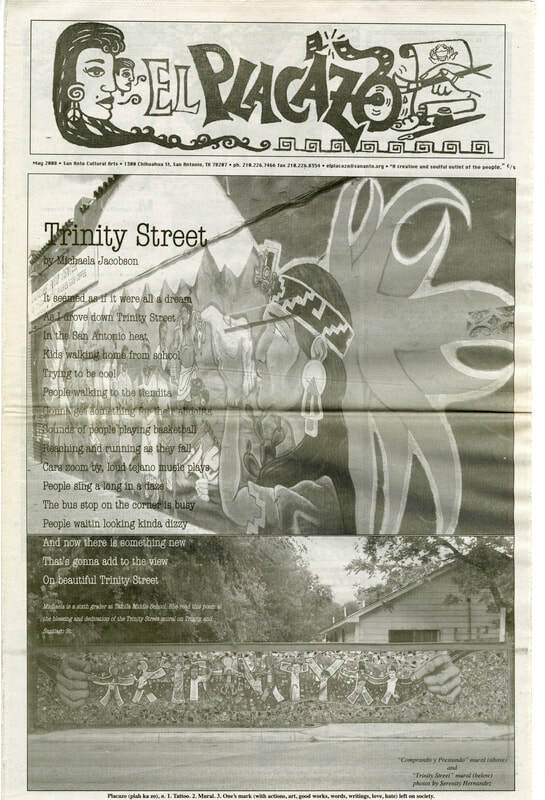 Initial planning and work began on our first “landmark” mural / public art piece (designating a street or a neighborhood) Trinity St. in early 2008. The public art piece is located on the privacy fence of a home here in our neighborhood. The fence is facing Trinity St. (a busy corridor) and was a prime target for tagging and vandalism. The aim of the project is to create a ‘landmark’ piece that will help eliminate the tagging/blight of residential areas/private properties while involving local families and the surrounding community in creating a beautiful piece of public art. A few months before painting this mural, Jose Cosme was invited to travel to Mexico for an Adolfo Mexiac show with one of his mentors, the Chicano artist Raul Valdez. Cosme asked Manny if he could loan some cash for the trip and Manny said “Sure, but this is an advance on your next mural.” Thus, Jose Cosme was contracted as lead artist for the Trinity Street mural. Cosme travelled through Mexico City, Cuernavaca, and Coyoacan, staying in the former studio of Jose Clemente Orozco, studying the work of los tres grandes in person, visiting art museums, and making prints with Adolfo Mexiac. When he came back to San Antonio, he brought these experiences with him and carried them into his art. There's always passerby's and those are the interesting people. Working on the Westside especially there's a lot of people who are, I got everything from like, "I just got out of jail" to people passing by, "I used to draw when I was little." I like that though, that to me is what, that was part of painting public art…I like working out in the community, I like community involvement, I like people seeing you, not putting something up in the middle of the night...I appreciate it,that community involvement, that input, that energy, the love. In high school, Cosme started working with Andy Benavides from the 1906 Gallery. Benavides referred Cosme to San Anto Cultural Arts, where he started working as a volunteer on mural projects. Everything for Everyone and Nothing for Ourselves was Cosme’s first mural as a lead artist. He then went on to co-lead Seeds of Solidarity with Mary Agnes Rodriguez and lead Trinity Street on his own. Cosme was also involved as a tour guide and spokesperson for San Anto, overcoming his natural shyness with his strong belief in the mission of San Anto Cultural Arts. I knew how important the organization was and what it did for people. It gave them a sense of power and belonging. Even the murals themselves, it’s a public piece, so I put it out there and it’s not about ego. It’s not about me. People take ownership.